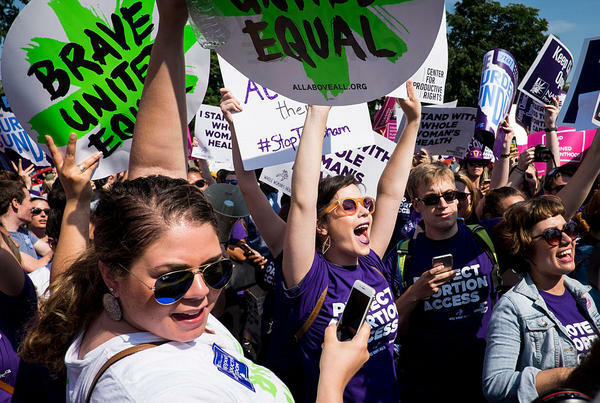 Abortion rights activists celebrate outside the U.S. Supreme Court Monday for a ruling in a case over a Texas law that places restrictions on abortion clinics. In a decision striking down key aspects of a Texas abortion law Monday, the Supreme Court cast doubt on similar laws in nearly two-dozen states. At issue in the court's decision were two specific provisions of a sweeping law to restrict abortions passed by the Texas Legislature in 2013. The provisions before the court required doctors who perform abortions to have admitting privileges at a hospital no more than 30 miles from the abortion clinic and required abortion clinics to meet the same health and safety standards as ambulatory surgical centers that perform much more complicated procedures. Opponents of the bill argued before the court that if both requirements were to be enforced, only 10 clinics would remain to perform abortions in Texas, compared with more than 40 before the law was passed. Such limited access in a state so large would cause an "undue burden" on a woman's right to obtain an abortion, they said. The court has said in the past that states can regulate access to abortion but not in a way that causes an undue burden on women. In a 5-3 ruling, written by Justice Stephen Breyer, the court said that "both the admitting privileges and the surgical-center requirements place a substantial obstacle in the path of women seeking a previability abortion, constitute an undue burden on abortion access, and thus violate the Constitution." One of the key questions was which side Justice Anthony Kennedy, who has been a swing vote on abortion issues, would join. He signed onto the majority opinion with the four justices who traditionally support abortion rights.The immediate impact of the ruling means that the plaintiff in the case, Whole Women's Health, will not have to close any more of its Texas clinics. "Every day, Whole Woman's Health treats our patients with compassion, respect and dignity," said Amy Hagstrom Miller, the founder and CEO of the group. "And today the Supreme Court did the same. We're thrilled that today justice was served and our clinics stay open." Many of the laws were based on models written by Americans United for Life, an anti-abortion legal group. Clarke Forsythe, the group's acting president, said today's decision "endangers women nationwide as health and safety standards are at risk." The Center for Reproductive Rights, whose lawyers argued the Texas case before the Supreme Court, says the decision could have far-reaching implications. While each individual state law will have to be judged on its own merits, this decision represents "a clear statement by the court about what the standard should be in these types of cases," said Julie Rikelman, the director of litigation for the group. "The benefits of restriction have to outweigh the burden." According to the Guttmacher Institute, 14 states, including Texas, require physicians that perform abortions to have admitting privileges or some other relationship with a nearby hospital, while 22 states have facility requirements that are very similar or exactly the same as requirements for ambulatory surgical centers. Rikelman said that in several cases where state laws were blocked pending the outcome of this case, including in Wisconsin, Louisiana and Alabama, "this reinforces" lower court rulings that found those laws "were likely unconstitutional." The main dissent in the case was written by Justice Samuel Alito, and joined by Chief Justice John Roberts and Justice Clarence Thomas. They argued that the constitutional question shouldn't have been triggered in the case, because part of the law had previously been challenged separately and the plaintiffs lost. "As we have said, a losing litigant deserves no rematch after a defeat fairly suffered, in adversarial proceedings, on an issue identical in substance to the one he subsequently seeks to raise," the dissent said. Kaiser Health News is an editorially independent news service that is part of the nonpartisan Henry J. Kaiser Family Foundation. Julie Rovner is on Twitter: @jrovner.